Bag and tote made of black nylon material, water and tear resistant, heavy-duty. Large bag holds most household embroidery/sewing machines and includes three zippered outside pockets and two Velcro inner pockets . 4 outside zippered compartments & 2 large internal pockets Embroidery Arm bag. Embroidery Bag Fits most embroidery Machines. - Size: 19" (L) x 7 (W) x 18" (H) Not machines over 19"
Slide over handle of embroidery machine bag. It's important to keep your machine safe and clean and to make traveling to and from class easy and convenient. This portable bag and tote is specifically designed for protecting and carrying your valuable machine and embroidery unit. See option below for large embroidery unit extra tote bag. Gotta Have It Bottom Bag is not large enough for some machines, so check the dimensions below. 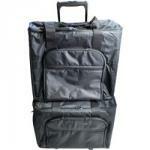 Bag and tote are made of black nylon material, water and tear resistant, heavy-duty. Removable tote with optional shoulder strap has two zippered outside pockets and casing that fits over cart handle. Very pleased and happy that when I emailed a question it was answered the next day. Very happy and when I need something again I will return. Love the Carry All Bag. Can't wait to go to my sewing classes with this "classy" bag. It is sturdy and well put together with a good solid structure for transporting my sewing computer, and all of the accessories. Great Value. Price on item was lowered by $10 the week after I purchased my bags....a little disappointed in that as I would have liked to have had a price match for at least 30 days after purchase, like most of the retail stores have. Other than that I am enjoying the bags and think the price was good when compared to similar items.